Dosbat: Some notes on the Early August Cyclone. Some notes on the Early August Cyclone. It's superfluous to say that there has been a major cyclone in the Arctic during the first week of August. I don't view this as having a pivotal role in whether we see a new record, but I do see it as having a role. This cyclone spawned from a relatively minor low pressure system that came in from north of Scandinavia and tracked across the Russian/Siberian coastal fringe. To be precise: A low over the UK moved up to Scandinavia and on 29/7/12 a small low pressure was pinched off the northern edge of this low pressure system. This pinched off residual low proceeded along the Siberian coast line, intensifying slightly, until on 1/8/12 it merged with (canibalised?) an existing low over the Arctic (poleward of Novya Zemlya). At this point the existing Arctic low broke down as the residual low fed off it. By 4 August the resultant modest low (10mb) had reached the central Arctic and from 5/8/12 it intensified. By 11/8/12 it has declined and is now off the Canadian Arctic Archipelago. It was only when this system entered the central Arctic that it grew. This behaviour of intensification of low pressure systems in the central Arctic is a feature identified by Serreze and Barrett. They find a central region where in Summer (JJA) there is a maximum count of cyclone centres. Figure 1b of Serreze and Barrett, count of cyclones across the Arctic region during June, July and August. The above figure shows that over the period 1958 to 2005 there was a count in excess of 135 in the central Arctic. This is the same region in which the recent cyclone occurred, so in terms of growth and location this storm was quite typical. However if we can use size and depth (pressure) as indicators of total power, this was the most powerful summer storm I've seen. Noting that the lowest pressure was 963mb Jeff Masters described the storm as "remarkably intense", "exceptionally" so for the summer. However is this enough to point the finger at climate change, and in particular the Arctic's climate change? Key to that question is whether there are trends that suggest an increase. Some commentators have suggested that the presence of open water is enough to assert a causal link to ice recession, this may seem reasonable because water vapour feeds storms. However that argument has a problem - Since 2007 there has been a large amount of relatively warm open ocean towards the end of each summer, yet the fact that this storm is seen as unique suggests that other low pressure systems entering the central Arctic haven't 'taken advantage' of the warm open waters. And as Serreze and Barrett shows, this storm is in a typical area for low pressure intensification and, from my reading, seems not to be unusual in that respect. i.e there have been many chances for such lows to explode as massively like the August cyclone did, yet this is the only one that did. This suggests to me that there is more at play than a cyclone 'taking advantage' of open waters due to the recession of ice. So what of trends in cyclones? Simmonds et al undertook an exhaustive examination of cyclones and Arctic climate change in 2008, using data up to 2006. They found no significant increase in summer cyclone counts or pressure depth since 1979. As I've previously blogged, Hakkinen et al examine ice speeds and find a significant increase in ice speed during the summer, however they put much of this speed increase down to thinner ice. Sorteberg & Walsh use vorticity to identify cyclones and examine trends in cyclones crossing 70deg N, they find a summer increase in cyclones crossing 70deg N, with summer cyclone paths from the Fram Strait across Siberia to the Bering Strait. However as mentioned earlier, this storm was formed from a minor low (about 10mb) starting north of Scandinavia, north of 70deg N, due to its low intensity and its starting north of 70degN I don't think Sorteberg & Walsh's finding can be used with regards the August Cyclone. One paper put forward by a commenter at Neven's Sea Ice Blog was Inoue & Hori, 2008, Arctic cyclogenesis at the marginal ice zone: A contributory mechanism for the temperature amplification? This details 'explosive' generation of a cyclone over the ice edge in September. However this is a different scenario to that of the August cyclone. In September the atmosphere is cooling after the Sun has set and large amounts of heat are drawn out of the ocean as ice begins to form. This is the reason for the storm Inoue and Hori observed and those observed by Polarstern in the aftermath of 2007 in the Beaufort Sea. This situation does not apply at present where there is still net solar influx into the Arctic system. So whilst, as Sorteberg & Walsh and Simmonds et al find, the strength and frequency of cyclones entering the Arctic has increased, the evidence of stronger cyclones within the region of intensification is more equivocal. So I don't see strong evidence of an increase that can be used to explain the recent cyclone in terms of such an increase. It seems to me that this cyclone's intensification is probably due to other factors. The loss of sea ice and consequent open water will play a role, but I do not think it played the pivotal role because many cyclones crossing the newly open water have not intensified to the same degree. Years with large losses of perennial ice are characterised by abnormal cyclone distributions and tracks during MMJ [May, June and July]. ...a reduction of the influx of these cyclones fosters anomalously low September sea ice. Our results also suggest that a strengthening of the central Arctic cyclone maximum during MJJ helps preserve the ice cover and leads to anomalously high September sea ice. However, the relationship does not appear to be entirely linear with a clearer association between low cyclone activity and reduced sea ice than between high cyclone activity and increased sea ice. So the linkage shown here is actually a reduction in cyclones causing sea-ice loss, not an increase. This is of interest because this season has not been typified by anti-cyclonic systems. From my reading of the weather data it seems to have been a low pressure dominated season, yet we're seeing a strong likelihood of a new record low. Is this epiphenominal of thinner ice? I'm convinced that the cyclone of early August 2012 will play a significant part in the progression of the melt season. This event is not responsible for the record breaking September minimum that seems likely, as I've previously shown, expectation of such a new record pre-dates the cyclone event. As throughout the summer, the low ice extent for the Arctic as a whole is primarily due to extensive open water on the Atlantic side of the Arctic (Kara, Laptev and East Siberian seas) and the Beaufort Sea. My previous post on the likelihood of a new record is based upon simple extrapolation of the average losses to minima from areas at set dates. This can be interpreted as relying on initial conditions as the main predictive factor. Given that initial conditions appear to be the key factor this late in the season, my attention turns back to the anomalous open ocean in Barents and Kara during the late Winter. With NSIDC's statement it would appear that, contrary to my expectation at the time, these conditions have indeed had a knock on effect even to current conditions; I had expected ice movement to fill in the gap, this effect seems not to have been as strong as I'd thought. With regards the recent cyclone I think the current impact is just the start. Bremen's images (see the archive there) show that from 1/8/12 the greatest loss of ice area and concentration has mainly been before the cyclone, with the cyclone merely dealing the coup de grace to an area of low concentration doomed to melt out. However current images from MODIS show that what remains, whilst large in extent is even more diffuse than previously. For example, see top right of this image. What the storm has done in real terms is guarantee that this region of low concentration ice will no longer play a significant role in the reduction of the main pack. It has also broken a novel record - for the first time we see a large mass of ice separated from the main pack by open ocean. The cyclone may also have disturbed the stratification of the Arctic ocean, although what long term impact this will have I am not sure. Such disturbances of stratification are not uncommon, although this one seems to have been more widespread, it remains to be seen how long term this impact will be, regional disturbances normally disappear within a week or two. More from Rob Dekker on this disturbance here. However in terms of the remainder of the season we are left with the same situation as before the cyclone. It will take sub-average melt rates to prevent a new record. I don't follow extent indices as I've come to the conclusion that they're too much of a blunt tool, even if they offer a higher degree of statistical confidence. However as of yesterday the area is lower than every year's minimum since 1979, except 2007, 2008, 2010, 2011. That may not seem stunning, but we still have a month to go to this year's maximum. There is one thing I'm hoping to learn in the coming weeks. 2007 and 2011 both set records, in my view they were so close it's fatuous to assert either was the record low. What both years have in common is that they both 'bottomed out' sometime in the last week of August, failing to either lose or gain notably until the middle of September. I have a suspicion that this might be due to the balance being tipped as the ice edge nears the pole - where insolation fails to win the battle against heat loss, as it does during the summer. If I'm correct in this suspicion then this year may not end up as low as extrapolation based on other post 2007 years might suggest. All of this seems to be depressing some people, sorry, but I find it incredibly exciting. Whatever you feel it's always good to have a laugh, fortunately the internet climate science community has a village idiot - Goddard provides as usual. Screen et al, 2011, Dramatic interannual changes of perennial Arctic sea ice linked to abnormal summer storm activity. 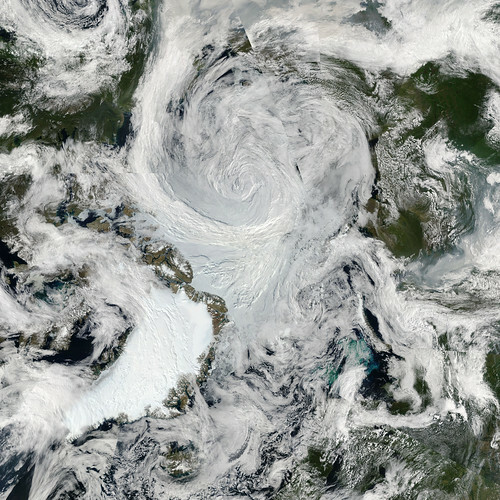 Serreze & Barrett, 2007, The Summer Cyclone Maximum over the Central Arctic Ocean. 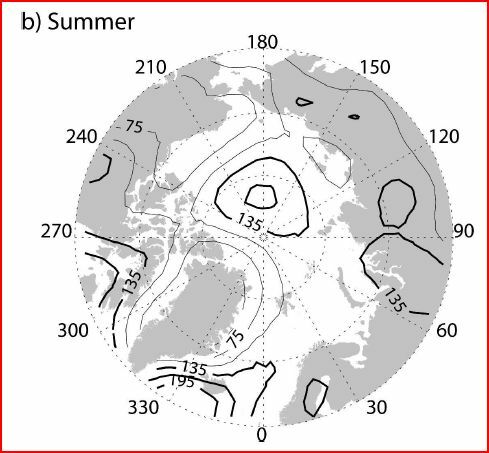 Simmonds et al, 2008, Arctic Climate Change as Manifest in Cyclone Behavior. and Neven's closing link to his blog - which I highly recommend as further reading. I think looking at weather patterns and it's extremes over the last few years, very little has been un-typical or exceptional including this Arctic storm, but what does seem unusual is that there seems, I admit anecdotally from my point of view, an over increase of such events but perhaps I am not looking for 'odd' weather. The denier sites are quick to point out that 'this drought or that flood, or storm' has happened before perhaps even worse but have all these events happened in the same time frame of months, seasons or years. I feel not but the trend hasn't yet emerged from the background yet. Insurance costs for damage has significantly increased but is this just due to increase value of structures and more people with insurance? I'm getting more and more confident that as it continues this 'global weirding' of the weather will be seen as the time the persistent odd weather started. Furthermore I think in years to come the Arctic link will be strengthened. As will Hansen's stance with his 'climate dice' argument. But as you say - it's early days. We need to be patient and watch it all unfold. Check out the IdiotTracker on my blog roll - The New Normal, Literally. That post has a little graphic of insurance losses due to thunderstorms, The Tracker notes that data for 2012 isn't in yet but could sustain the increase. So in the throes of a recession some Americans call a depression the high levels are sustained. Yet I'd have thought that one of the first things someone in dire financial circumstances 'has a holiday' from is insurance costs. I could be wrong, but I'd expect that if the increase trend were due to economic growth then when the economy falters the trend should follow suit. PIOMAS and Cryosat, an indication.